Microcurrent therapy can help horses that are bleeders due to suffering from Equine Induced Pulmonary Hemorrhage (EIPH). Horses that bleed out of their nostrils due to damaged lungs are called bleeders. Bleeders tend to be horses that are stressed in sprint racing sports such as circle-track Thoroughbred racing, barrel racing, cross-country jumping, and other speed events. Lasix® is the medication that has become the standard treatment for EIPH. Lasix® (Furosemide) is a strong diuretic that releases built up fluids so that they pass through the urine. This helps but in many instances does not stop the bleeding. 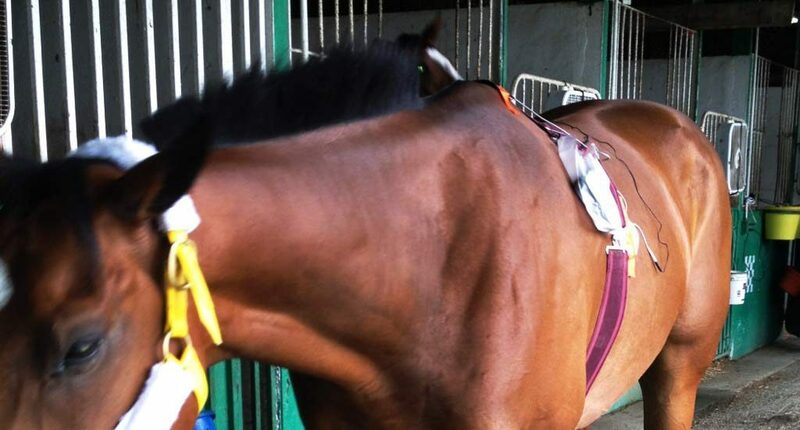 Betty Fetters, a multi-racetrack microcurrent therapist from states in the Southeast, discovered that she could greatly improve the odds and comfort of a known racehorse bleeder. She treated the horse with microcurrent three times on consecutive days before a race and the bleeding was stopped. This eliminated the need for Lasix® and clear lungs were verified prior to the race by a veterinarian’s check with an endoscope. Fetters’ treatments started with a triangular pattern of three electrodes (show in the illustration). One electrode was at the withers and two electrodes split, so that there was one on both the left and right sides of the rib cage over any part of the general lung area. The total treatment is approximately 60 minutes. This treatment can also be reduced to 30 minutes if the horse receives regular microcurrent treatments for maintenance and/or other conditions. When a horse dies at a sanctioned U.S. racetrack a necropsy is required. A necropsy is a horse autopsy to confirm the cause of death. The track veterinarian where Fetters worked shared with Fetters that the horses she had worked on showed signs that the alveoli and capillaries in their lungs had healed. This was something the veterinarian was not accustomed to seeing at the track. The veterinarian has since passed away and no papers are known to have been published on the subject of using electrical stimulation in the microamperage ranges for the treatment of bleeders. To reduce stress-related bleeding, Fetters would also treat other areas of the horse’s body that were painful. Different track surfaces tend to present different problems for horses, and it is common for track horses to have sore feet or heel pain. If a horse was experiencing heel pain, Fetters would treat it with microcurrent and often the horse’s lung bleeding would also stop. Fetters protocols were shared in the book MicroCurrent for Horses (2007) for others to try. The method continues to be reported as helpful in reduction in bleeding to no bleeding with little change to the protocol. The only changes are using newer options in electrodes and more efficient microcurrent devices to reduce treatment time per session to 30 minutes. An additional update is taking a closer look at the overuse of electrolytes, which could be a contributing factor for dehydrating rather than hydrating the horse. Before starting microcurrent therapy for your horse’s respiratory condition, Exercise-Induced Pulmonary Hemorrhage (EIPH), consider why this has happened. Bambi Dore, a bodyworker and equine therapist, shares a revelation from her work at the thoroughbred race track. She noticed the correlation between the use of electrolytes and increased cases of EIPH. You’ll find many equine nutritionists and veterinarians agree that for horses at the track, or other shorts stints of exercise, do not call for major dosing of electrolytes. By being aware of proper use of supplements and specific types of microcurrent treatments, it is possible to help horses that are bleeders without using Lasix. This article contains excerpts from Matrix’s MicroCurrent for Bleeders Quick Guide and Deborah Powell’s book MicroCurrent for Horses (and other vital therapies you should know).